Jared Unzipped: When The Police Overreact. 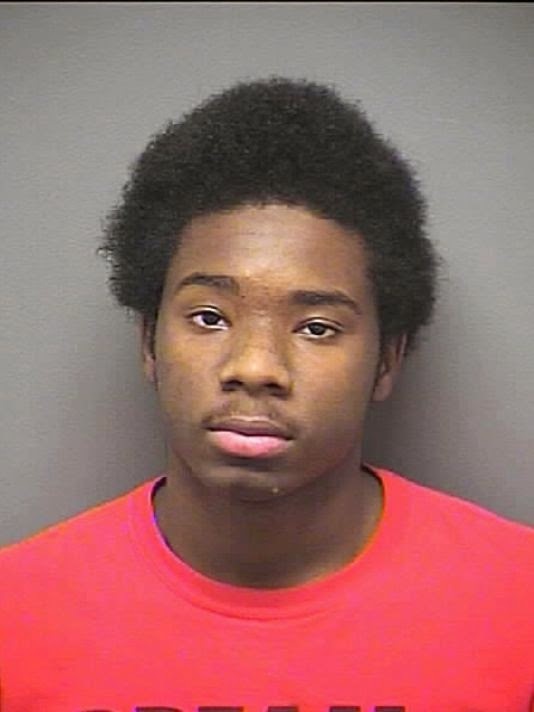 Tony Cleveland, Jr. (17) of Greensboro, North Carolina was arrested yesterday on charges of urging a riot, possession of a handgun and weapons of mass destruction. Why? Because of this image he created and posted to his personal Facebook account. That's right -- it's now completely illegal to create an image that the police might not agree with. 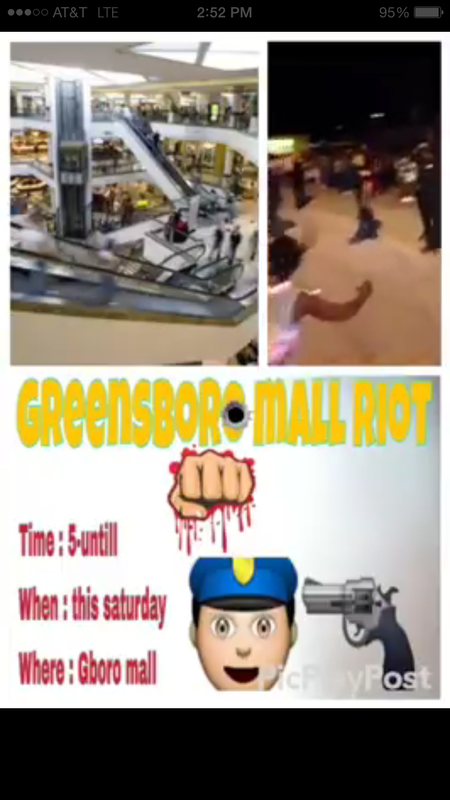 Based upon information gleaned from the suspect's father, Tony had no intentions of actually causing a riot at the "Gboro Mall". Mind you, such a mall doesn't even exist. There are two major shopping destinations in Greensboro -- the Four Seasons Town Centre and the Friendly Center. The image doesn't state if either of these locations was the intended "target". The time on the flyer also says "5-until". Is that 5 AM or 5 PM? The when says "this saturday". So which exact Saturday is that? Obviously, this image was created by an immature teenager with little intention (or the necessary planning) to actually carry out a riot. Most likely, the teenager crafted the image because of the recent news involving the Baltimore Riots. Like any impressionable youth, he decided to become involved in some silly, misguided way. It doesn't make what he did right, but it also clearly doesn't pose a threat to anyone. Common sense is a hell of thing. Would you think this potential riot was serious if you saw that image? I wouldn't. If you think the above image was serious, then you need to get a grip on reality. I'm not going to defend Tony -- he's a juvenile delinquent with a long string of charges including breaking and entering. Clearly, he has little respect for the law and his parents probably did a terrible job raising him. Yet, there's cause for alarm when any police department would charge someone over a silly image -- much less with urging a riot, possession of a handgun, and weapons of mass destruction. Does this image indicate that the creator has WMD's? If so, they must be as invisible as those supposedly owned by Saddam Hussein. Does the fact that he placed a cartoon image of a gun next to a cartoon image of a police officer's head mean he has a handgun? What about people that possess tattoos which have weapons in them? Does that mean the individual owns those exact weapons? If a kid has a poster of an F-16 fighter jet in their room, does that mean they own said plane? No. Only idiots think such nonsense. If the police are going to begin arresting people for images on social media that they don't agree with, then they better build more prisons. Nearly everyone has shared or liked an image on Facebook that law enforcement might not agree with. We'd all be guilty. This is yet another example of the police over-reacting and over-stepping their boundaries. The People of this Nation have every right to produce images like the one above. The First Amendment protects individuals in cases like this, whether you happen to agree with the content or not. I don't agree with it, but what I think doesn't matter. Had Tony and a band of his friends actually carried out a riot, then sure -- charge them to the fullest extent of the law. Up until that point, though... it's all just childish foolishness. Riots are absolutely wrong and should not be encouraged -- they only cause reckless bodily harm and damage to property. Yet, let the sentence be appropriate for the crime. I find myself asking... what crime took place here?